An in-depth look into some of the projects we have worked on with schools. 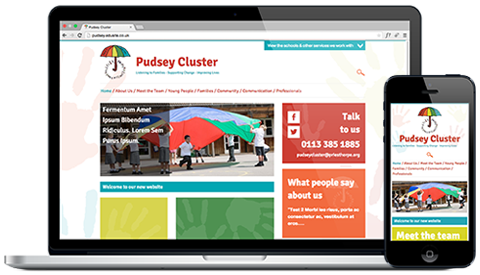 Pudsey Cluster is a not-for-profit organisation that brings together local schools and children’s services in the Pudsey area of Leeds. They approached us after we were recommended to them by Farsley Farfield Primary School. The cluster were running a logo competition for children within their schools (we must say, we were really impressed! ), and their plan was to pick the best ones and for those to form the basis of their new branding. They were also looking for a full range of stationery design and a responsive website. The website needed to be easily accessible with links to the many services they partner with. We met with Pudsey Cluster on a couple of occasions to discuss their ideas and requirements. The logo competition winners were chosen and we took these and made them in a digital format, keeping to the style of the hand-drawn logos as much as possible - they were that good we didn't want to change them. 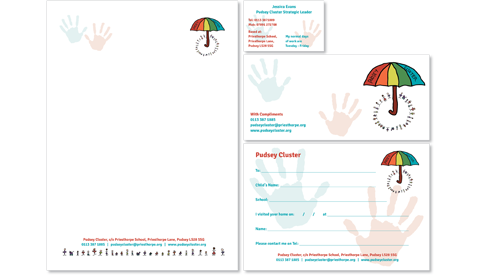 We then created the stationery designs, which included a letterhead, business card, calling card compliment slip and various branded Word Documents for the team at Pudsey to edit in future. The website took on the style of the stationery and utilised the many colours from the winning logo design, giving the site a clean, professional yet child-friendly feel about it. The site uses an interactive map on the home page that drops down from the top when clicked. The map shows all the services the cluster is linked to and has clickable links to the various schools, children’s centres and professional bodies. 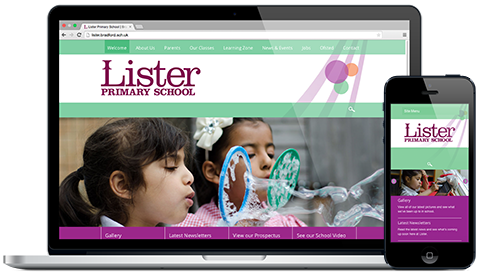 Lister Primary School were looking for something a bit more colourful than their existing brand offered them. The goal was to bring out the personality of the staff and children within the three phases of the school. The school sits in the heart of a vibrant community with years of heritage associated with the nearby Lister Mill, an icon on the Bradford landscape that is viewable for miles around. 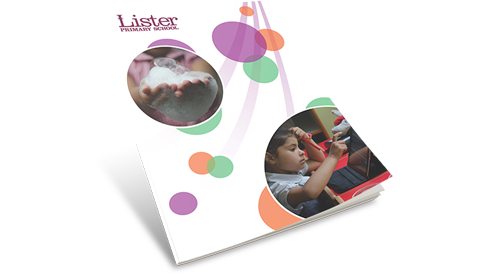 As a large school, they needed a website and prospectus to be diverse enough to tell parents and visitors all about the events and activities the children get up to as well as the standards they expect from the children. Communicating their success stories really mattered to the school. We chose a colour palette of three contrasting colours to show the three phases the school wanted to highlight. Taking inspiration from the shape of the Lister Mill chimney the design focused on the lines in the structure as well as photographs of the children blowing bubbles in the playground. The design was integrated throughout the website and prospectus and even formed the basis of the ID cards the staff wear in school. The website is mobile responsive and is fully editable by the staff if needed as well as the Edusite staff. The website is used as a vital communication tool to parents as well as a showcase to the community about what the school has to offer. The prospectus gives more in-depth information on school rules and policies, but keeps the content light and interesting thanks to the design. UAK already had a very colourful logo and strong ethos, and wanted to portray this going forward in their new website. Because of the large size of the Academy, the website needed to show the diverse activities and events the various years and subject groups got up to day to day. 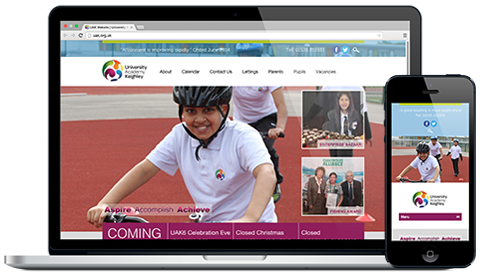 Delivering news to parents and visitors in an engaging way was paramount to UAK, and they wanted to use the new website as their primary communication tool. Their slogan “Aspire, Accomplish, Achieve” was a key focus of their site and they wanted this to appear prominently on their home page to really show that they believe in their pupils’ future. Based on the existing logo and colour scheme, we made the site bright and colourful but more tailored to older children given the age range. They wanted to show off the achievements in the form of a photo gallery, so we added this as a full width slideshow at the top of the home page, overlaying the most recent news posts in decorative boxes. On the news page we went for something a little different by tiling the items and attaching a featured image to each post. The site really takes into account their slogan and is regularly updated by the school using the easy to upload content management system. This enables parents to quickly and easily see what the school has been up to as well as view any important information.